Hatchimal CollEGGtibles have a magical new place to play; Enter the Hatchery Nursery ; an enchanted forest where you can hatch and care for your CollEGGtibles; In the middle of this whimsical playset, youll find the Hatching Tree; Use it to help hatch the exclusive CollEGGtible included in this playset. Place the speckled egg inside a secret flower, hidden deep inside the hatching tree trunk. Spin the yellow handle and youll see the flower carry the egg up, up, up; Once it arrives at the top of tree, the purple petals will open and your cracked egg will emerge; Finish hatching by pressing down on the shell. Now you have a new CollEGGtible; With 35 places to play and display, theres room for your entire CollEGGtion; Koalabee, Kittycan and Penguala can swing off the tree hooks, grab a snack at the feeding station, take a nap in the spinning mobile, or hang out under the streamer shower; Send your extra-playful hatchimals down the slide, or give them a push on the swings. Hatch and care for your hatchimals Colleggtibles at the hatchery nursery; There are 35 places to play and display throughout this whimsical hatchihome; This special set comes with an exclusive Hatchimal CollEGGtible. Place the CollEGGtible inside the hatching tree and it will pop out the top with a cracked shell, ready for you to hatch; Use the spinning cribs, swings, slide, shower and more for magical Hatchimal fun; One supplied. Styles may vary. Size H25.4, W30.48, D13.34cm. For ages 5 years and over. WARNING(S): Not suitable for children under 3 years old. Only for domestic use. To be used under the direct supervision of an adult. This toy does not provide protection. Where can I buy Hatchimals CollEGGtibles Hatchery Nursery Playset? 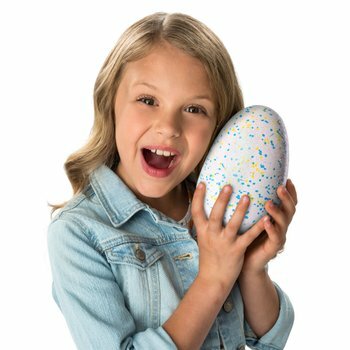 Where can I buy Hatchimals Glittering Garden Draggle?